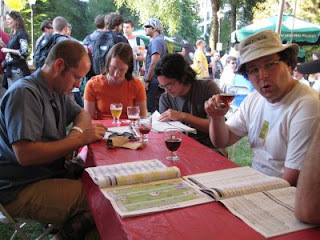 The weather was beautiful last weekend for the Portland International Beerfest -- very pleasant compared to the heat wave during the Organic Brewers Festival a few weeks ago. Even if had been as hot as that, the location helps a lot: there are eight or nine huge trees in the block where PIB is held, as opposed to the single tree that adorns the 12 acres at Overlook Park. On Friday night the pleasant breeze helped clear out the cigar smoke that so oppressed another blogger on Saturday. It's true, there were an astounding number of cigars being smoked, and lots of dogs, but children weren't allowed this year. I'm not much on prohibiting kids from beer festivals, but given the small space and the large crowd at the PIB this year, I think it worked out for the best. I mentioned before that the Jolly Pumpkin Oro de Calabaza was the standout beer for me -- the one I'd never had that really impressed. After reading Jeff's account of the Harviestoun Ola Dubh Stout aged in Highland Park whisky casks, I'm embarrassed that I was too stingy to spend the $4 for a taste of it. Chalk it up to my experience last year with the J.W. Lee's barleywine aged in Lagavulin casks: it sounded wonderful but was such a disappointment that I was afraid the Ola Dubh would let me down in the same way. The Allagash Black was listed as a "Foreign Stout", which made me think it would be like the unusual and delicious stout from de Dolle. It wasn't bad, but didn't stack up to my expectations. I was discussing it with a stranger while waiting in line for something else; in his opinion it should really be compared to Brussels black ales, like New Belgium's 1554. Sadly, I never got back around to the Allagash tent for a sample of Curieux, their barrel-aged Tripel, but I can heartily recommend it based on previous experience. Wow, googling around for a website for Mahr's, I stumbled upon my own notes from last year's PIB, on Lee's blog. I had forgotten that he published them. Just another reminder of what a good time the PIB is -- yet another reason not to leave Portland during July. I'm glad you were able to try more beers than I, and your conditions better for enjoying the event. Maybe I just had bad luck.